It's time for our final Idea Gathering wrap up before we head off to Boston for the Total Customer Experience Leader's Summit to enjoy the real thing next week! 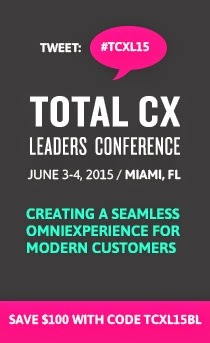 The Total Customer Experience Leaders Summit provides both B2B and B2C case studies and translating these innovations and insights is a huge part of the value of the conference. Our unique idea gathering wrap-ups between sessions facilitate this translation and were one of our most highly rated features last year. This year we're continuing the tradition with extended Q&A Idea Gathering sessions. We have built in extra time for questions, feedback and open conversation during each break. Moderated by Jeff McKenna from Chadwick Martin Bailey, these sessions will provide a forum for more in-depth discussions. This week, we chuckled at this piece on new finance website The Billfold detailing "How to Score a Refund From Your Terrible Internet Service Provider in 12 Emotionally Complicated Steps." Similarly, when it comes to mobile, CMS Wire confirms that many businesses are struggling saying, "Not everyone it seems is having an easy time arranging their customer experience management (CXM) strategies around mobile first." So how do you achieve that balance between channels? Businesses today need to be available to respond at all touch points, and also be providing the kind of customer experiences that don't drive customers away. As this article on Bizcommunity.com states: "Lip-service isn't enough since anyone can follow a conversation between a company and a customer and make up their own mind." So how do you handle the juggle? Any tips for finding the balance? Share with us in the comments! Don't forget, You can follow us on Twitter or become a fan on Facebook for industry news all week long and live updates from the event next week!